I agree, some sort of Panicum. I just cut mine back a few days ago. Most winters it stays very upright like in your picture but this year in that first big snowstorm most of it got crushed. I grow 'Heavy Metal' which hits around 5.5' (including seeds) with solidly blue leaves. It's a nice grass when space is limited. 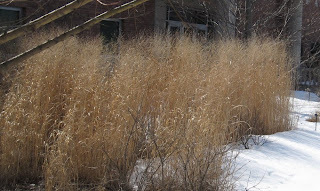 When you've got room to let it spread out a bit you can't beat a Miscanthus ('Graziella'/'Gracillimus' is my favourite or 'Huron Sunrise' for a little more colour in fall) for overall impact and sturdiness in heavy snow. 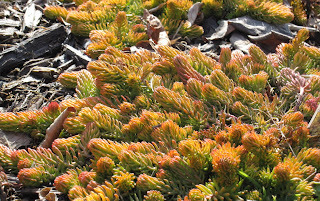 Instead of 'Autumn Joy' you could try a purple leaved sedum like 'Xenox' which would contrast very well with Sedum 'Angelina' during the summer as well as look good in the winter. Panicum, of course. Thank you both of you! I KNEW that, my brain just wouldn't produce it. I do like miscanthus, Andrew, but they seem to take more of a beating under the weight of our heavy snows. The Panicum are all still standing strong and looking good. I do wonder why these yucca look so perky? The others I see around town are decidedly more flopped over looking. Maybe drainage. Note to self: must, must get Y. 'Color Guard' for this year...if you grow it that well through a winter, I'm going to give it a try here in Alaska. 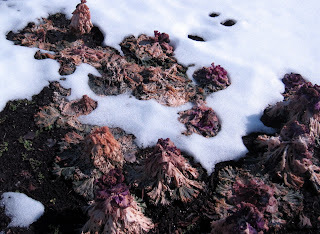 Like you I get lots of snow cover in the winter so winter interest plants aren't very interesting. I need early spring interest. 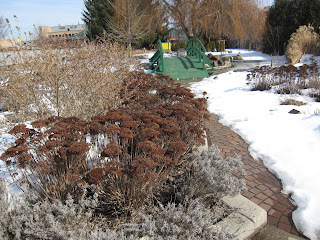 I've got major zone envy of the gardens in warmer climates (I'm in Massachusetts and my crocus have just started to show buds, no blooms yet). You are so right about "winter interest" -- I'm realizing, I think, it is really about: When the snow melts interest. As soon as I see the ground, I want to see color! 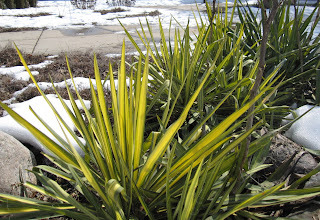 Do see Cyndy's comment... re yucca. They look spectacular there, but not so great elsewhere around town, and I'm not really sure why.